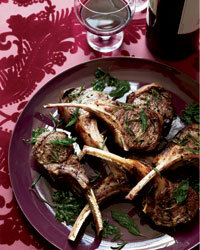 Grüner Veltliner pairs beautifully with food. So why did this onetime sommeliers’ darling fall so far out of favor? 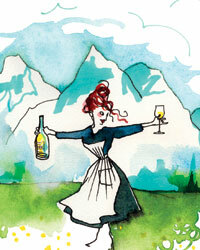 Lettie Teague goes to Austria to find out. There are certain defining moments in history—the occasions that inspire us to ask one another, “Where were you when…?” and fill in the blank with an important event, such as the death of Elvis Presley (or maybe now Michael Jackson), or Barack Obama’s election as president, or the Dow’s dip below 7,000 points in March. For me, one of those seminal moments was the afternoon when I learned the correct pronunciation of Grüner Veltliner, the white grape of Austria. It was about 11 years ago, on a summer day when my now-ex-husband, Alan, and I were invited to our neighbors’ house for a drink. Our hostess, Doris Schuetz-Mueller, opened a bottle of wine. “Grüner Veltliner!” I exclaimed when she presented the label. “I’ve been hearing a lot about that wine lately; it’s very trendy.” I pronounced Veltliner the way most Americans do, VELT-leen-er. Doris, a native of Vienna, looked horrified. “It’s Velt-LEEN-er,” she said, shaking her head. It was as if I had deeply maligned, not merely mispronounced, her country’s most famous grape. More than 11 years later, I can close my eyes and still hear Doris’s words, delivered in a ringing Austrian accent: Velt-LEEN-er. And yet, despite such an unsettling beginning, I developed quite an attachment to this hard-to-pronounce grape. Alas, the popularity of Grüner hasn’t lasted quite as long as that memory of Doris. Favored by seemingly every sommelier in America in the late 1990s, Grüner Veltliner (nicknamed Groovy) was subsequently discarded by those very same professionals when they began looking for something new to put on their lists. Instead, they began touting wines with equally unpronounceable names: Torrontés, Moscofilero, even Assyrtiko. Though these wines do share some vowels with Grüner Veltliner, that’s about all they have in common, as far as I’m concerned. For starters, none of these other wines has the range of Grüner. Although Grüner’s signature is a spicy, peppery nose, the wines can be light and simple (a bright and refreshing aperitif) or rich and profound, depending on where and how they’re grown. In fact, a well-aged Grüner Veltliner can bear a close resemblance to white Burgundy in richness and texture; a top Grüner Veltliner can easily mature for a decade or more. Sometimes much more. But most importantly, Grüner Veltliner is remarkably easy to pair with food: It goes as well with meat as it does with fish or even vegetables. Given its many virtues, I was curious to learn why Grüner Veltliner had been so summarily dispatched in recent years, a search for its substitute so soon undertaken. Why did there need to be a “next” Grüner Veltliner, anyway? Why wasn’t the first one sufficient? Naturally, I realize that Grüner Veltliner was not the first wine to fall out of fashion. A list of once-sought-after wine names reads like a roster of faded Hollywood stars: Pouilly-Fuissé, Beaujolais Nouveau, Chianti, not to mention the still-maligned Merlot. But I would argue that Grüner Veltliner has more compelling qualities than all of these. It’s the most important grape of an entire country, albeit a country the size of Maine. Could it simply be that Grüner Veltliner is difficult to pronounce? Or that it comes in such a range of styles? Or maybe it’s the Austrian labeling system, which is even more difficult than that of Germany—no small accomplishment. Or could the problem be Austria itself? After all, not many Americas know much about Austrian culture beyond Strauss waltzes and Sacher torte. Or, finally, is it because Grüner Veltliner isn’t grown anywhere else? Unlike, say, Cabernet Sauvignon and Pinot Noir, which are successfully produced all over the world, Grüner Veltliner hasn’t really gotten around. There’s a little in Hungary, a little in Germany, but few countries have truly adopted it. I asked a few sommeliers why they thought Grüner had lost its appeal. Belinda Chang, the wine director of The Modern in New York City, said it was “too trendy” and that she’d stopped drinking it a year-and-a-half ago for that reason alone. She added, “Grüner was kind of a one-night stand for me”—words that would break an Austrian’s heart. And yet she must have had more than one fling: There were seven Grüners on The Modern’s wine list. “That’s the most I’ll ever have,” she replied. Terry Theise, an importer of many great Austrian wines, speculated that Grüner may have fallen from grace because new sommeliers were trying to make their mark. “Some of the new guys might feel like Grüner Veltliner was the wine of an earlier generation, and they want to find their own wines,” he said. Who knew there was a Grüner Veltliner generation gap? 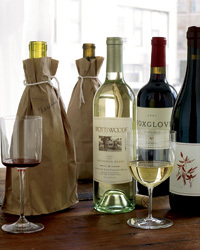 Even knowledgeable retailers like Joe Salamone—wine buyer for New York’s Crush Wine & Spirits, which has one of the city’s better Grüner Veltliner selections—admitted that they could be a tough sell, especially when prices go north of $40 a bottle. Under those circumstances, he said, “Even our best Austrian customers will choose Riesling first.” He added, though, that some white Burgundy drinkers were buying top Grüner Veltliners instead of Burgundies these days, finding them to be a better buy. Only Andrew Myers, the sommelier of CityZen in Washington, DC, gave Grüner Veltliner unqualified praise. “It’s a great wine, and it’s incredibly versatile,” Myers noted. “There isn’t a vegetable that doesn’t love Grüner Veltliner. The really peppery Grüners can hold their own with meat dishes, and the big, loamy ones can handle seafood dishes with great aplomb.” There are currently 13 Grüner Veltliners on his CityZen wine list. But, he admitted, “They don’t get asked for all that often”—though he has had some success getting people to try them at the lower and mid-range prices. A one-hit wonder or a wine for the ages? There was only one way to find out. I decided to travel to Austria and talk with the winemakers themselves. I’d visit the wine regions where the best Grüner Veltliner is made: the Wachau, the Kamptal and the Kremstal. I’d even stop at a couple of wineries in Vienna, where there are a surprising number of producers and even about 1,700 acres of vineyards within the city limits. I began in Langenlois, the most important wine town in the Kamptal. It’s a little village, though it does boast a trendy boutique spa and hotel called the Loisium, created by New York architect Steven Holl. There are quite a few famous wineries in Langenlois, including Weingut Hirsch, my first stop, where voluble young Johannes Hirsch seemed surprised that Grüner Veltliner was my focus. “Grüner Veltliner? Not Riesling?” he said. But such supercheap Grüners have never really been exported to the United States. Most of the Austrian wines that come to this country are generally of very good quality, which makes the dismissal of Grüner that much harder to reconcile. Even inexpensive wines like the Veltliner #1 from Hirsch ($18) are quite pleasant—juicy and refreshing. The #1 has sold very well here in the States, Hirsch confided, especially after they put a cartoon of a stag on the label. (Hirsch is the German word for deer.) “When we changed the label, we sold five times as much wine,” he said. No surprise, perhaps, to the label designers, or to the drinkers of Australia’s Yellow Tail, the most famous cartoon-label wine of all. But Hirsch produces a wide range of non-cartoon labels, too, including acclaimed single-vineyard Grüner Veltliners and Rieslings. Although I’d admired the Rieslings, I was even more impressed by the Grüners. They’re wines of intense purity and minerality, especially Hirsch’s signature Heiligenstein and Lamm vineyard bottlings. (The Heiligenstein vineyard is one of Austria’s most prestigious.) Hirsch brought out several vintages of these Grüners so I could see how they differed. The 2008 Lamm was big, rich and powerful, with Grüner’s trademark spicy, peppery nose; the 2007 was much leaner and more tightly wound—“discreet,” Hirsch called it—while the 2006 was much riper, more voluptuous and expressive. Each was, in a way, a prototype for its vintage. In 2007, most Grüners were high in acidity (“classic,” winemakers said), while the 2008 vintage was “difficult but promising.” The 2006 vintage was “easy” and a great success overall. 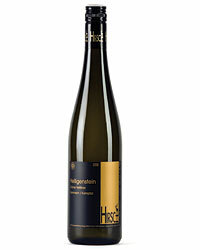 Hirsch himself is a sort of prototype, the embodiment of the modern Austrian winemaker. For example, he was one of the first to bottle his wines under screw cap (many Austrian winemakers then followed), and he operates out of a hip tasting room with large glass windows that provide a panoramic view of his vineyards. But, like many other Austrian winemakers, he is a bit of a traditionalist, too: He uses the same large old oak barrels that his father did, and his glass tasting room is tucked behind centuries-old buildings. When I asked Hirsch if he was bothered by Grüner’s fall from grace in the States, he shook his head no. His winery was doing quite well. (In fact, Hirsch’s importer, Terry Theise, called it the best winery of the year.) Besides, he added, “We’re small enough that it doesn’t affect our sales.” He said Hirsch could sell all of its wines in Austria. Did he think Grüner Veltliner was as great as Riesling? I asked. He gave his answer in two parts. “It’s harder to make a great Grüner than it is a great Riesling,” he replied. As for greatness, well, what he liked about Grüner was that it was Austria’s very own—the same evasive yet patriotic answer I was to hear over and over. I was immediately taken with Bründlmayer himself as much as I was by his wines. In a too-big sport coat, with a slightly preoccupied air, he seemed more shambling professor than important wine producer, even though he has been making great wines for nearly three decades. Did I want to taste both Riesling and Grüner Veltliner? he asked. Of course, I replied, though I was particularly keen to try the Grüner. 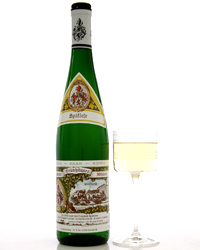 In fact, Bründlmayer added, he was currently drinking Grüner Veltliners from the 1992 vintage. Then he promptly produced a bottle of his 1992 Lamm vineyard that was so fully covered with cellar mold it looked like the label had grown facial hair. Yet the wine inside was fresh and lively. Had any one of those Grüner-dissing sommeliers, I wondered, ever had a 17-year-old Albariño that tasted like that? In fact, Bründlmayer lamented that people in Austria liked to drink their Grüner Veltliners far too young. His countrymen, he reported, had been asking for the 2008 wines as early as the previous spring. “Austrians like young wines,” he said. “So do Americans,” I responded. Only the English, he replied dolefully, really understood how good a well-aged Grüner Veltliner could be. Michael Moosbrugger of Schloss Gobelsburg told me the same thing—in fact, he was on his way to London for a tasting soon after our lunch (a kind of Austrian chow mein). Schloss Gobelsburg was easily the grandest winery of my entire Austria trip. A yellow castle dating back to the 18th century, it is now owned by monks but run by Moosbrugger, whose family owns a fancy hotel in the western part of the country. Moosbrugger, a small, precise man, has run the winery at Schloss Gobelsburg since the mid-1990s. He has a reverence for tradition—“The monks have been making wine here for hundreds of years,” he told me—and yet he acknowledges that the Austrian wine industry’s emphasis, until recently, was on mass production. “It’s only been in the past 20 or so years that wineries in Austria have focused on quality and not quantity,” he said. When Moosbrugger began making wine in 1996, Riesling was considered more valuable than Grüner Veltliner, but he believes this is no longer true. “Winemakers have changed their attitude toward Grüner,” he noted. They have embraced it because, he said, in an echo of Hirsch, “It’s ours.” On the other hand, he posited, there isn’t an enormous amount of excellent Grüner Veltliner around. “There are maybe 20 producers of great Grüner Veltliner,” said Moosbrugger. A great Grüner, he explained, needed a good vineyard site (with just the right elevation—not too flat and not too steep, somewhere at the foot of a slope). The site had to have a good water supply and soil with a high mineral content and the right balance of clay. Fortunately for Moosbrugger, there are plenty of great vineyards in the portfolio of Schloss Gobelsburg. He makes four single-vineyard Grüners, two of which I was particularly impressed by: the wonderfully minerally 2008 Schloss Gobelsburg Steinsetz Grüner Veltliner (“This is the wine we drink the most often,” noted Moosbrugger) and its much richer, spicier, mouth-filling counterpart, the 2008 Schloss Gobelsburg Renner Grüner Veltliner (“This is a wine that’s best when it’s about 10 years old”). I asked if Moosbrugger had noticed any drop-off in his American sales in recent years. A bit, Moosbrugger allowed, but then he could sell all of his wines to Austrians alone. If there is one winemaker in Austria who would seem to be immune to the trajectory of trendiness, it is F.X. Pichler. Indeed, the brochure in the Pichler tasting room summed up its place in the world: “F.X. Pichler is the Château Latour, Domaine de la Romanée-Conti, Zind Humbrecht, Sandrome and Helen Turley of the Wachau.” This fulsome quote was attributed to wine critic Robert M. Parker, Jr., circa 2002. When we sat down to taste, Pichler, like Hirsch, seemed surprised that I was there specifically for Grüner Veltliner. Though he claimed he was a fan of the grape (“We love Grüner because it is our own,” he said), he didn’t think it was great—or at least not as great as Riesling. But, he said, we should taste both grapes. So he began bringing out Grüner Veltliners and Rieslings one bottle at a time. I observed that the Kellerberg vineyard seemed to be a perfect site for both Grüner and Riesling, though in fact I liked the Dürnsteiner Kellerberg Smaragd Grüner Veltliner the better of the two at this particular age: The Riesling showed more pure fruit, while the Grüner had substance and weight as well as beautiful fruit. I wondered what it would be like with a few more years of age, and Pichler obliged by fetching one more bottle, the 2000 Dürnsteiner Kellerberg Smaragd Grüner Veltliner. It had the weight and the creaminess that Grüner takes on over time, and yet the acidity was still impressively fresh. How could Pichler believe Grüner wasn’t great when it could age as well as this wine did, never mind how wonderful it tasted in its youth? But there wasn’t time to debate the point: Pichler had to get back to his contractor, and I had several more visits ahead of me, including one with Toni Bodenstein of Weingut Prager, another top Wachau name. Bodenstein was pressed for time, he said, when I arrived. He had just come from a 40th-anniversary celebration of the local kindergarten and had another meeting soon after our tasting. Bodenstein is not only the winemaker at Prager—he married into the family—but also the mayor of the town and the chairman of the bank. He’s held all three positions for years and has no inclination to give up any of them, he confided, “although there is a mandatory retirement age at the bank.” While Bodenstein’s multiple lives have left him harried, he still brought out the bottles for our tasting one at a time, including his sought-after 2008 Achleiten Grüner Veltliner. When I mentioned this inefficient bottle delivery to Wachau winemaker Rudi Pichler the next day, Pichler—no relation to F.X.—waggishly suggested, “Maybe they were hoping you would give up and leave.” He may have been kidding, but it did seem to sum up the kind of conflicted attitude the Austrians have toward Grüner Veltliner. They admired it, especially when it had a few years of age, but they didn’t seem to want to love it, or want to talk about it, as much as Riesling. On the plane ride home from Austria, the thought occurred to me: Maybe all this Grüner deprecation was just a big show. Maybe the Austrians just want to keep Grüner Veltliner for themselves. And talking about how difficult it is to produce outstanding Grüner, how the grapes needed a very particular vineyard site, with the right elevation and soil, and couldn’t really grow well outside of Austria (except in England?) was a ploy to keep outsiders at bay. After all, every Austrian winemaker I met told me he would be perfectly able to sell all his Grüner Veltliners domestically. They didn’t really need the American market at all. I couldn’t wait to tell every sommelier I knew about my realization. If there’s one thing that sommeliers—and frankly, all Americans—will pursue, it’s something we are told that we can’t have. And so, I predict the next Grüner Veltliner boom will be—now.